The proper and accurate measurement of pH is one of the most critical factors in any laboratory procedure. At Next Day Science, we offer pH meters and colorimeters that meet even the most demanding pH measurement requirements. In addition to checking general acidity and alkalinity, our specialized meters measure the pH of silica, chlorine, phosphate, phosphorus, bromine, calcium, chromium, and ammonia, From bench top to portable to pocket pH meters, you are sure to find the right meter for your laboratory needs. The pH level is a measure of how acidic or alkaline water is. The range goes from 0 - 14, with a 7 being neutral. A pH of less than 7 indicates acidity, whereas a pH of greater than 7 indicates an alkaline, or base. The value of pH is actually a measure of the comparative amount of free hydrogen and hydroxyl ions in the water. Water that has more free hydrogen ions is acidic, whereas water that has more free hydroxyl ions is basic. Since pH can be affected by chemicals in the water, it is an important indicator of water that is changing chemically. These chemical changes can affect the outcomes of other tests performed in a laboratory as well. Levels of pH are reported in "logarithmic units". Each number represents a 10-fold change in the acidity/basicness of the water. Water with a pH of five is ten times more acidic than water having a pH of six. The pH of water determines the solubility, (the amount that can be dissolved in water) and biological availability (the amount that can be utilized by aquatic life) of chemical constituents such as nutrients and heavy metals. Nutrients include elements such as phosphorus, nitrogen, and carbon. Heavy metals include elements such as lead, copper, cadmium, and more. In the case of heavy metals, the degree to which they are soluble determines their toxicity. The lower the pH, the more soluble they are, increasing toxicity. The Benchmark pH meters monitor the pH electrode and buffer solution. These meters will warn the user in the event the calibration buffer is out of specification (possibly from cross-contamination) and if the pH electrode is dirty. In the event the electrode is dirty, it will either need to be properly cleaned or replaced. These machines also have an automatic or manual temperature compensation built in to reduce errors, and offer the ability to store and download information. The name “colorimeter” is used to describe any instrument that is used for the determination or specification of colors. The digital laboratory colorimeters from Next Day Science are used to find the concentration of a substance in a solution, based on the intensity of the color in the solution. If the solution that is to be tested is a colorless liquid, a reagent is added that reacts with the liquid, producing a color. Colorimeters measure the absorbance of wavelengths of light at a particular frequency (color) by a sample utilizing the Beer-Lambert’s law. Digital colorimeters are used widely across different work areas including environmental testing, clinical diagnostics, pharmaceutical analysis, and biochemistry. The handheld digital colorimeters found here can be used for on-site environmental analyses as well as in a laboratory environment. Colorimeters can be used to test water quality by screening for chemicals such as fluoride, chlorine, cyanide, dissolved oxygen, iron, zinc, phosphorus, calcium, silica, bromine, ammonia, and more. They are also used to determine the concentrations of plant nutrients (such as phosphorus, nitrate and ammonia) in the soil or hemoglobin in the blood and to identify substandard and counterfeit drugs. Colorimeters are also widely used to monitor the growth of a bacterial or yeast culture. 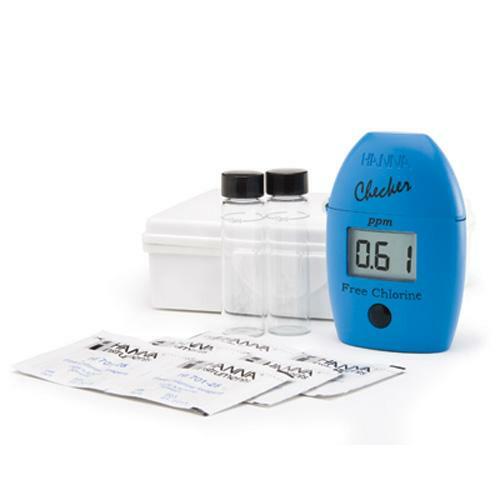 The portable colorimeters available at Next Day Science are the Hanna Checker® handheld colorimeters. These color coded and clearly labeled testers are more accurate and consistent than chemical test kits, and eliminate the hassle of color matching by providing a direct result, digitally. They are dedicated to a single parameter and are convenient to use in almost any setting. Some of the parameters able to be tested are alkalinity, chlorine, nitrite, silica, bromine, calcium, fluoride, and chromium, as well as many others. Regardless of the reasons you are testing water quality, these are the tools you need to do it! Next Day Science offers highly reliable pH meters and colorimeters that make the job easy, cost effective, consistent, and accurate. As ever, we are committed to providing you with the best tools to advance your research.